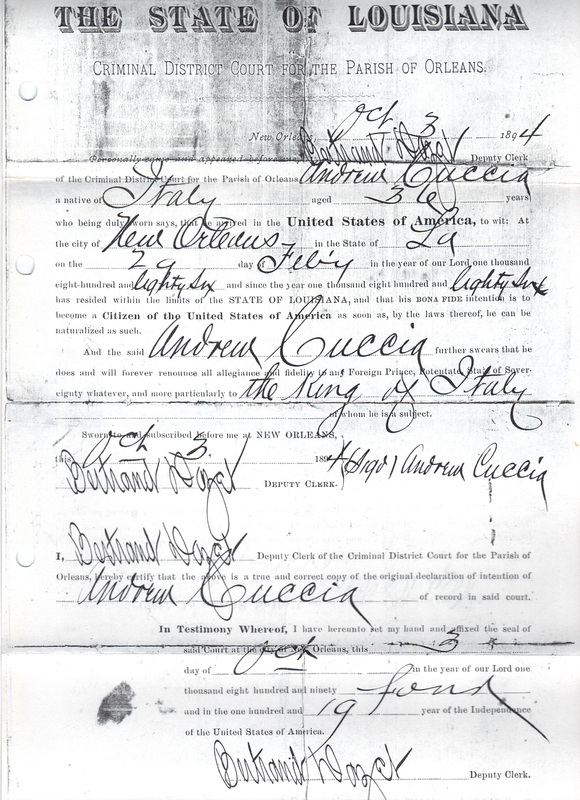 Andrea Cuccia, son of Antonino Cuccia and Rose Ajavolasit, was born October 28, 1858 in Piana dei Greci, Sicily. 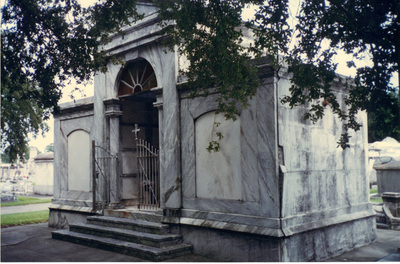 He died November 7, 1926 (age 68) in New Orleans, LA. 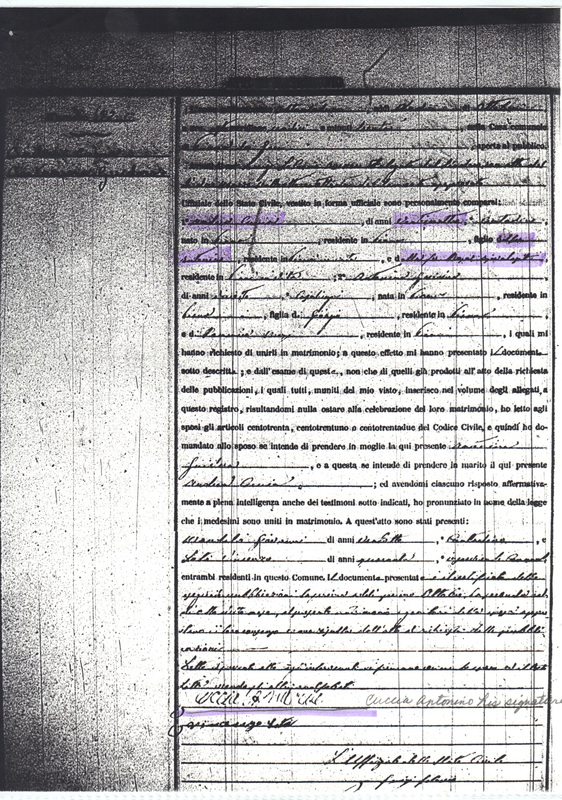 He married Antonina Guidera, daughter of Giorgio Guidera and Domenica Massi, on October 12, 1882 in Piana dei Greci. 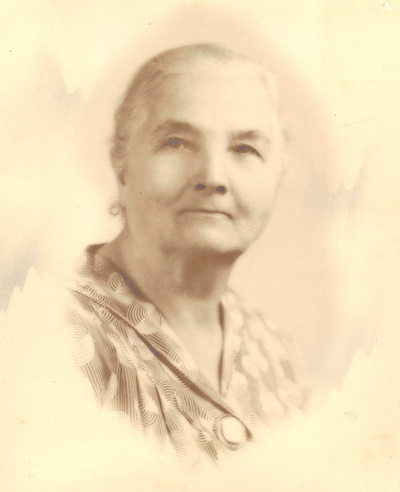 She was born December 8, 1864 in Piana dei Greci and died April 17, 1955 (age 90) in New Orleans. 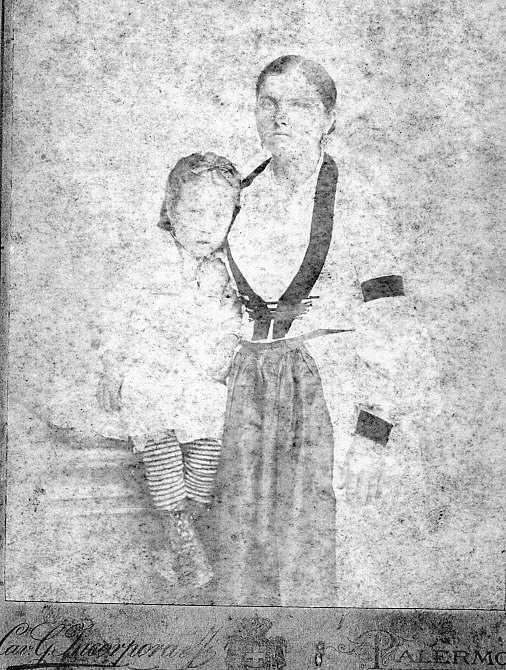 The learn more about the descendants of Andrea and Antonina, click here. 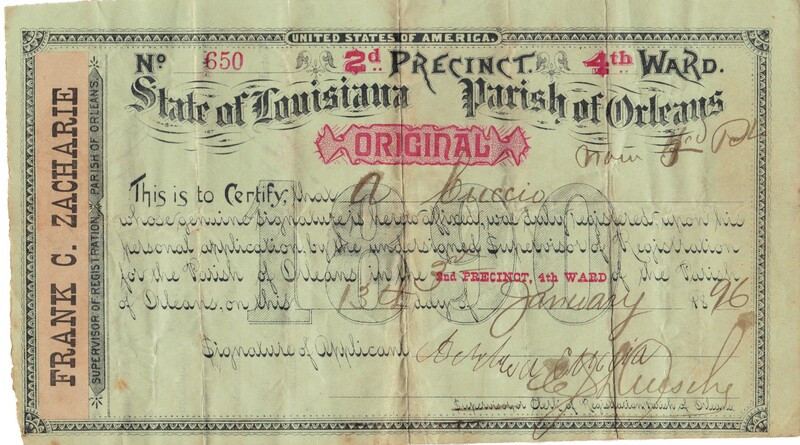 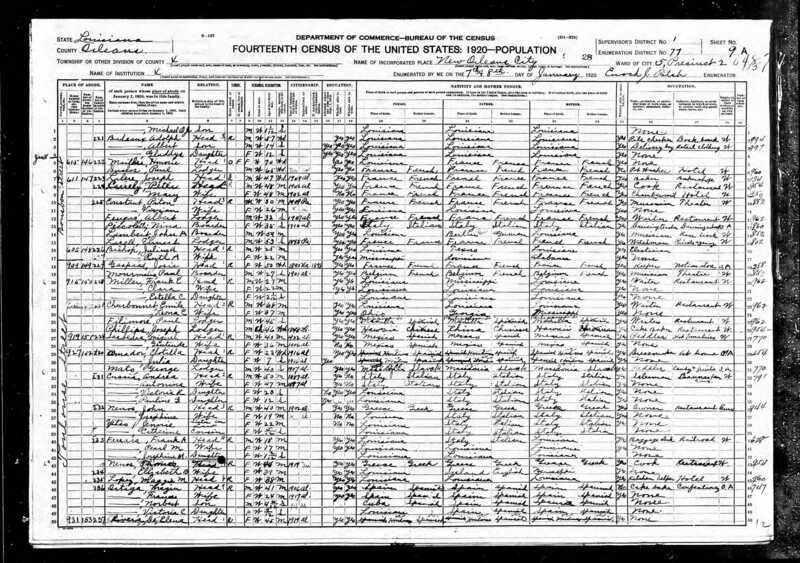 1900 Orleans Parish Census - Andrea appears in this census as "Henry" (age 40) and Antonina as "Lena" (age 33). 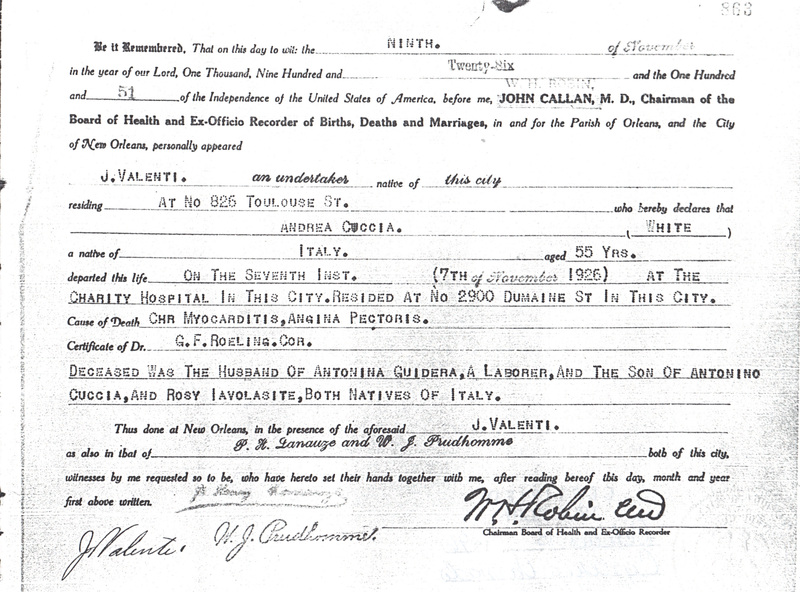 They are living at 1305 Bienville Street with their daughters Rosa (age 14), Doma (age 2) who would be Domenica, and Victoria (age 1). 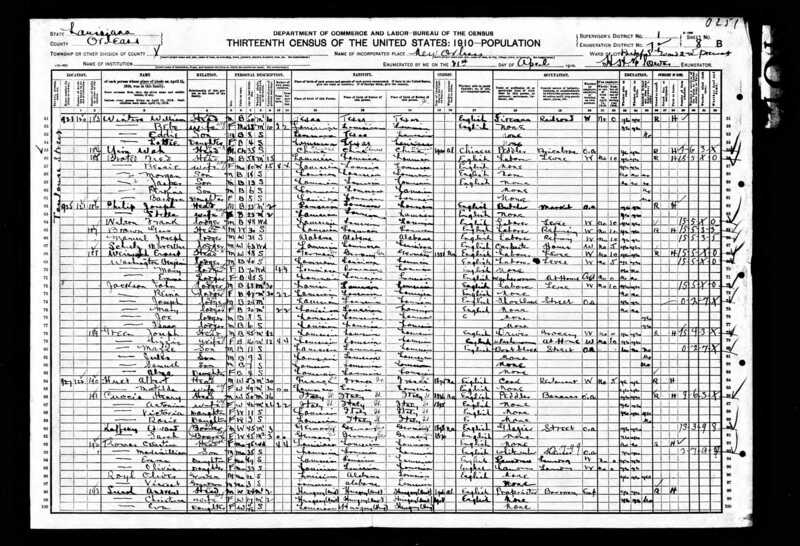 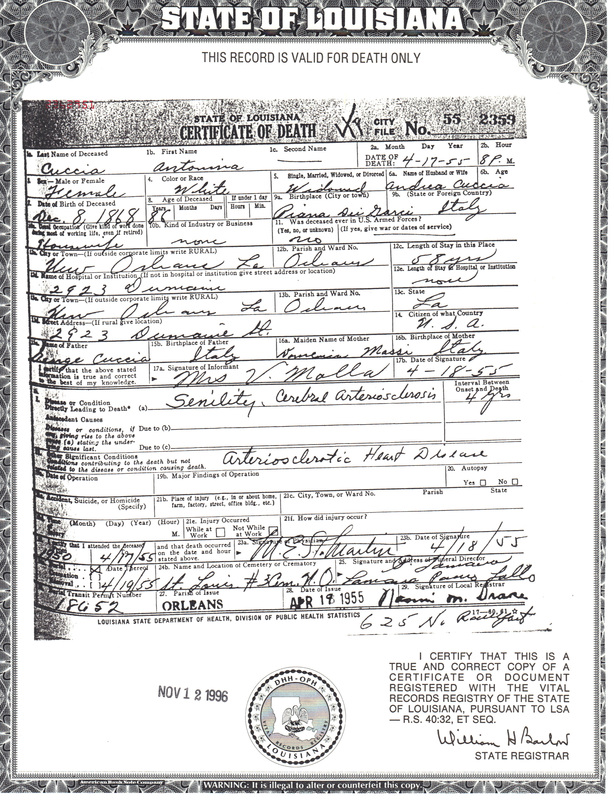 Henry's occupation is Day Laborer, and the Census indicates that he arrived in the U.S. in 1886 and that Lena and Rosa both arrived in 1897. 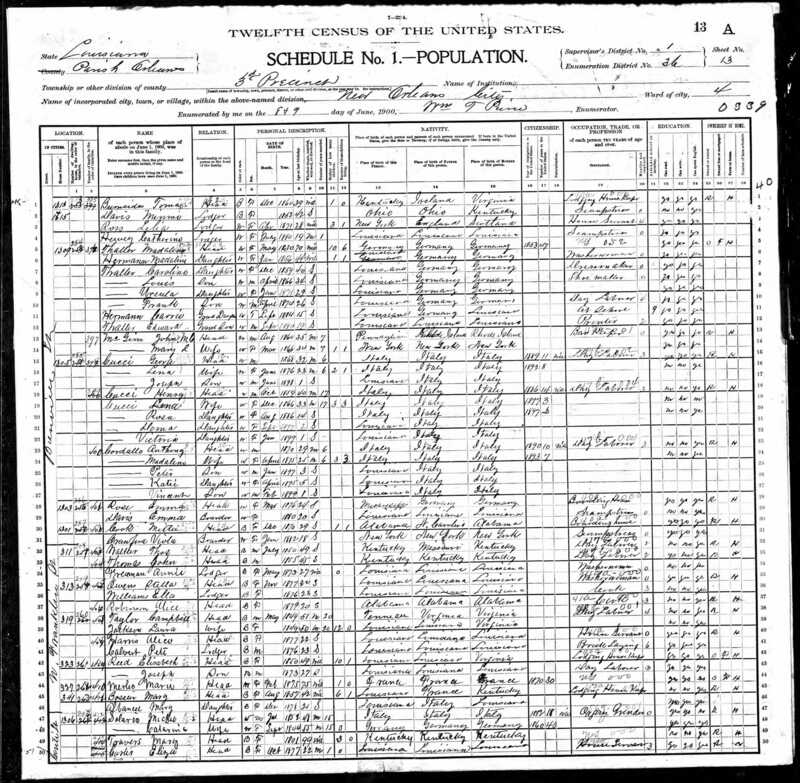 1910 Orleans Parish Census - Henry (age 50) and Antonina (age 42) are living at 927 Toulouse Street with their daughters Victoria (age 11) and Rosie (age 3), who would be Pauline. 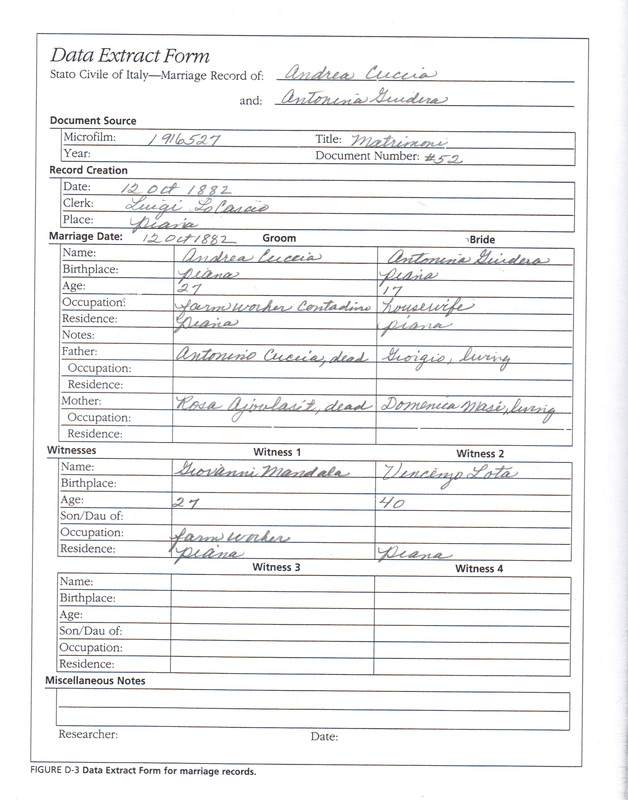 Henry's occupation is Banana Peddler. 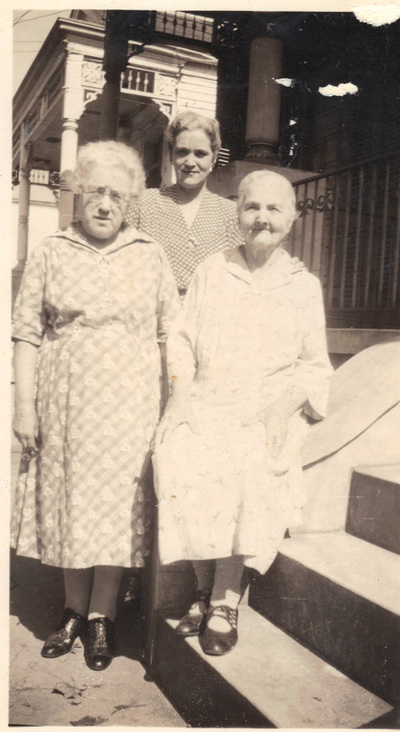 1920 Orleans Parish Census - Andrea (age 50) and Antonina (age 47) are living at 927 Toulouse street with their daughters Victoria (age 20) and Pauline (age 12). 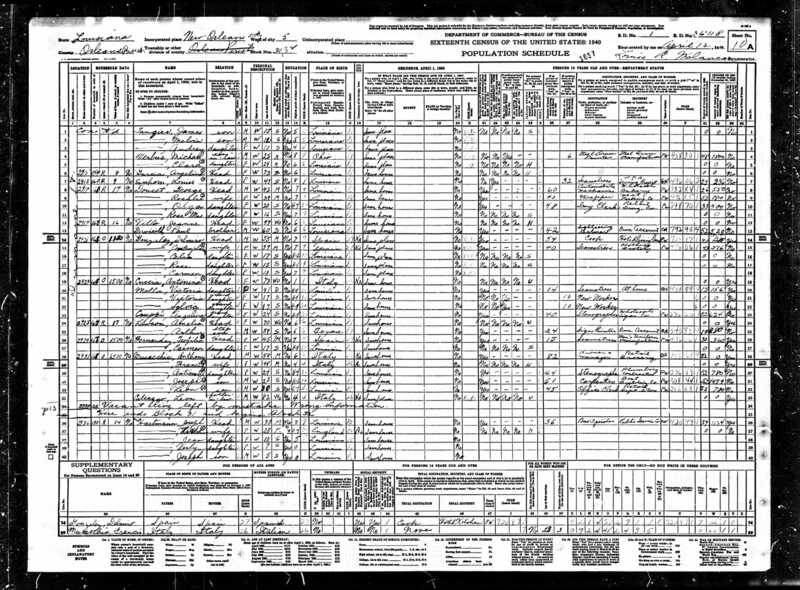 Henry's occupation is Banana Salesman. 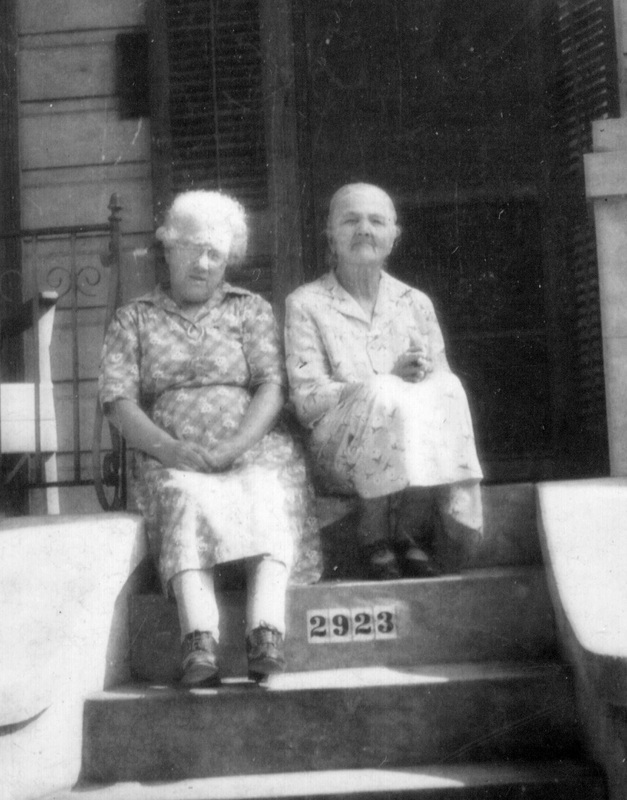 Andrea and Antonina's ages are considerably off as they were recorded in this census. 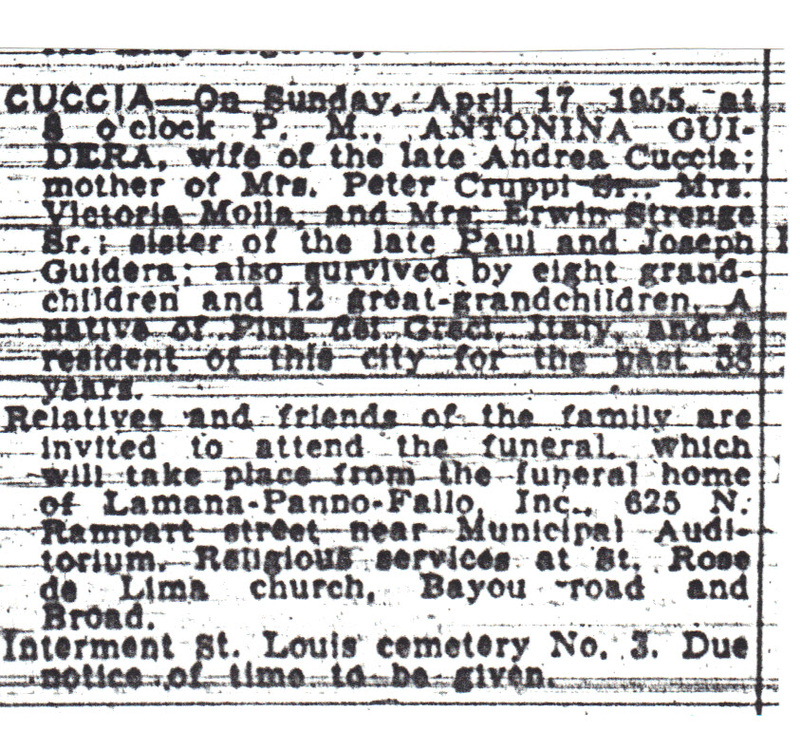 1930 Orleans Parish Census - Antonina (age 60) is listed in the census as "Antoinette" Cuccia, widowed and living at 2923 St. Philip Street with her daughter Pauline (age 22). 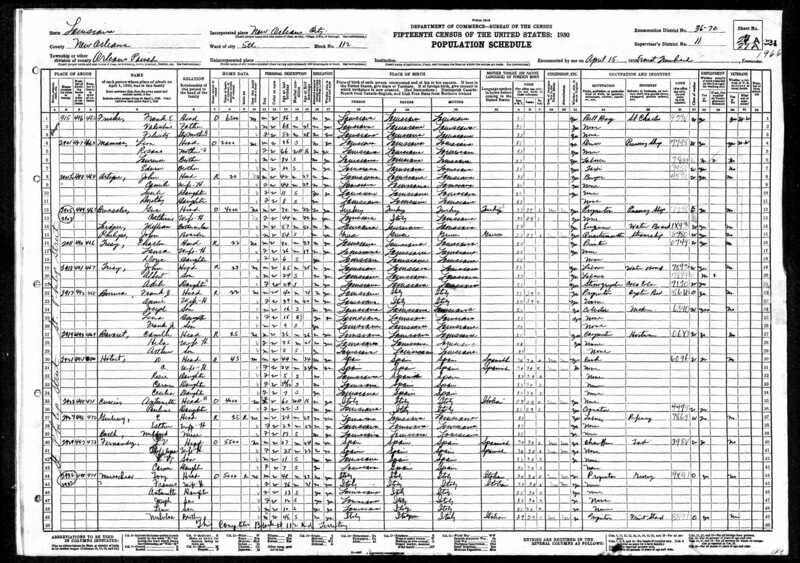 1940 Orleans Parish Census - Antonina, age 73, is the head of household living at 2923 Dumaine Street with her daughter Victoria, and her granddaughters Victoria and Sylvia Molla and Angelina Cruppi. 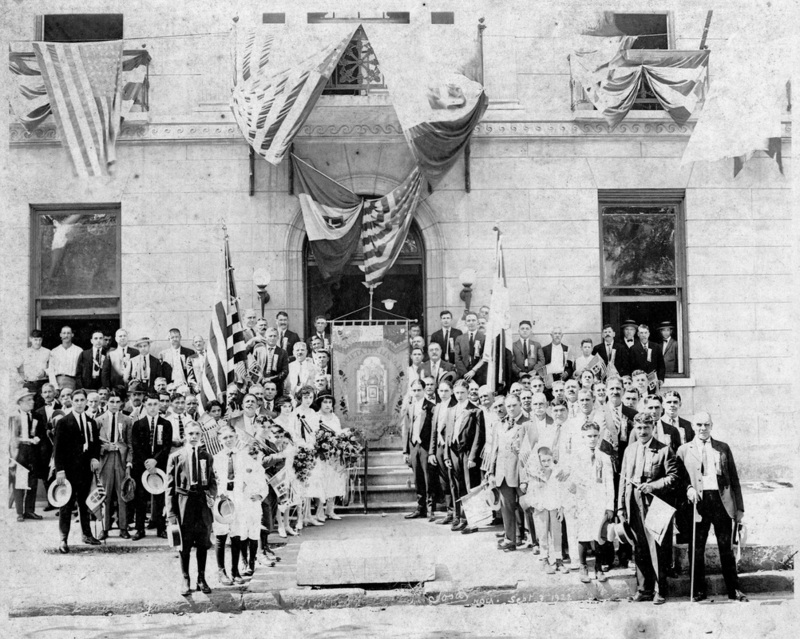 "La Societa Italiana di Mutua Beneficenza Maria S.S. Odigitria di Piana dei Greci" - Sept 3, 1922 in front of the Italian Hall at 1020 Esplande Avenue. 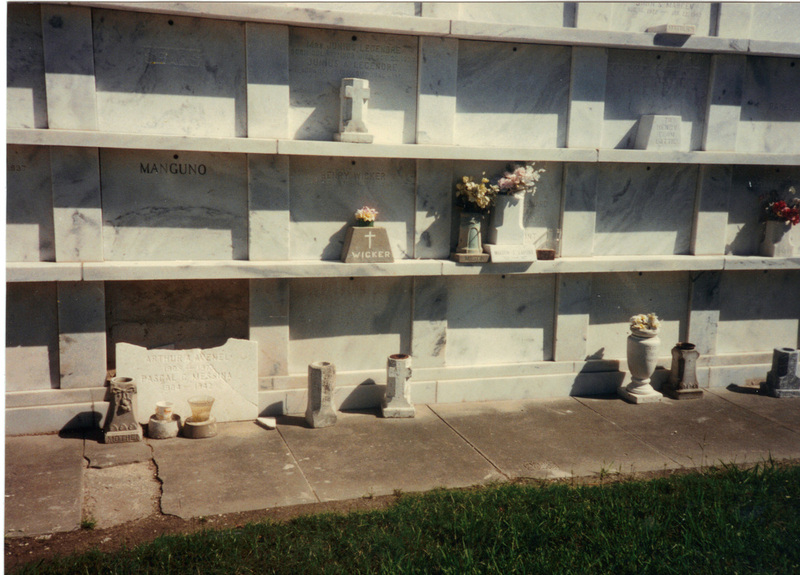 Andrea Cuccia is on the back row far right in front of the window. 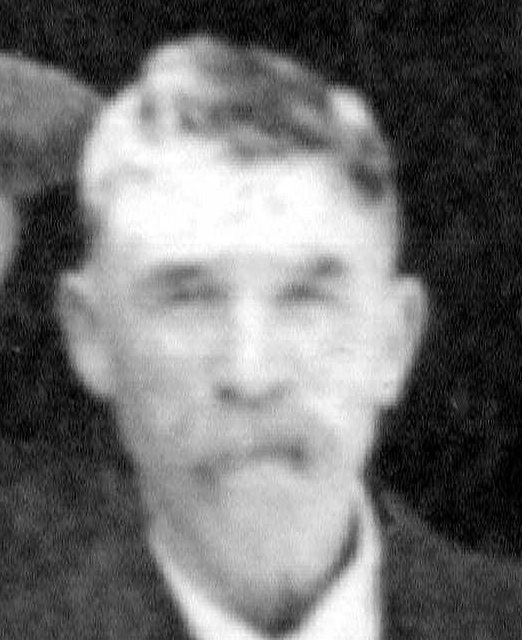 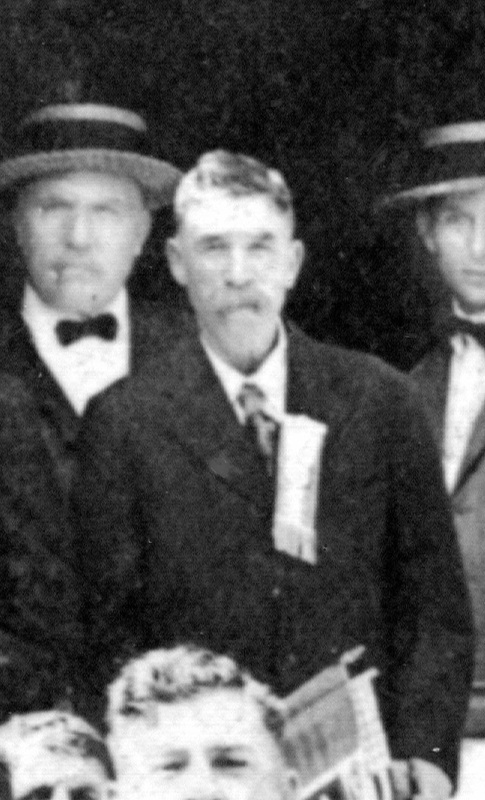 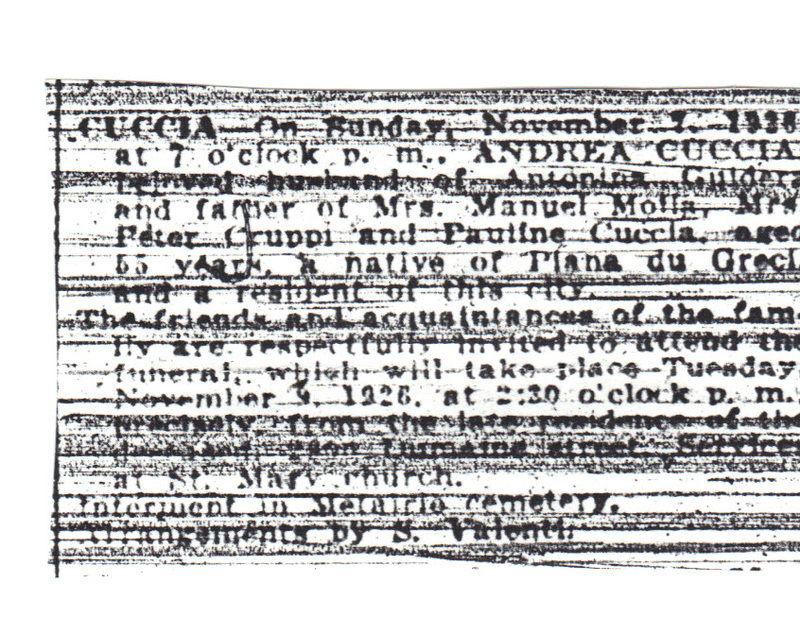 Next to him are his son-in-law Peter Cruppi and grandson Henry Cruppi. 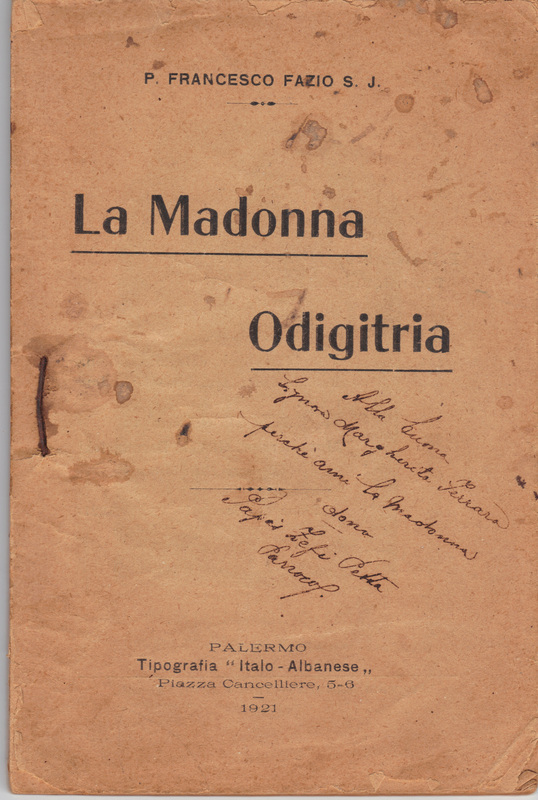 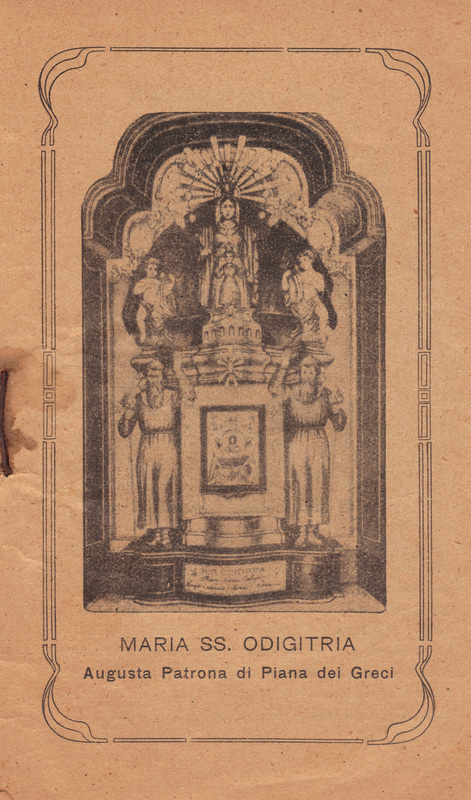 Antonina's booket "La Madonna Odigitria"
From Antonina's booklet "La Madonna Odigitria" - a shrine similar to this image can be found in the Italian Society tomb where Andrea Cuccia is buried. 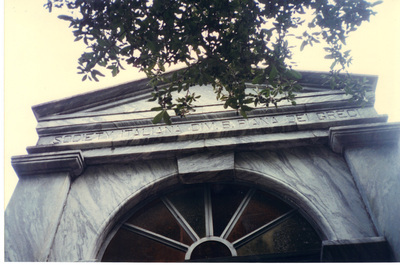 Inside of the Piana dei Greci Society tomb / Metairie Cemetery. 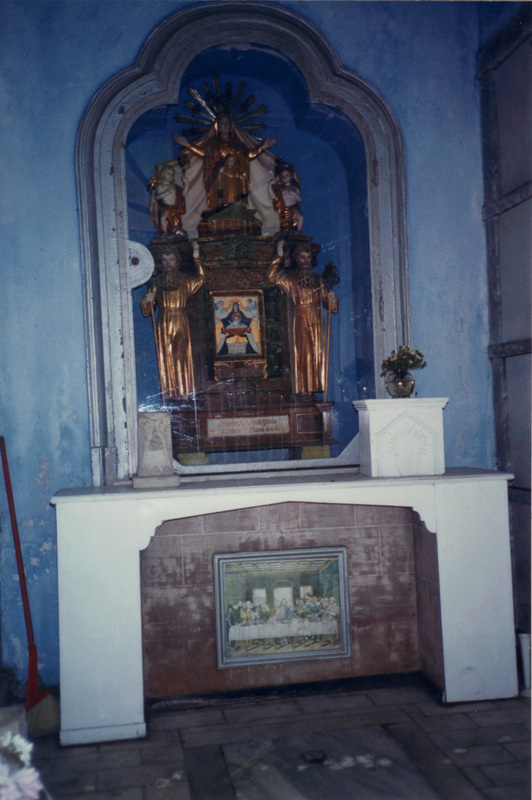 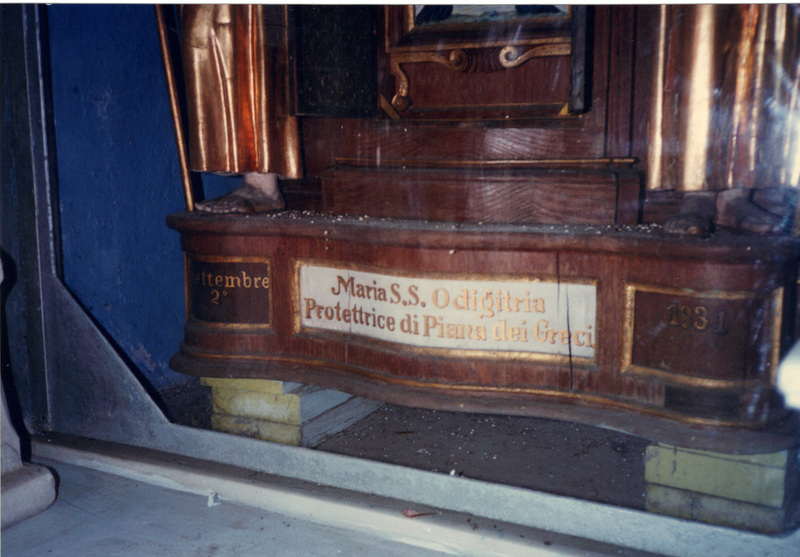 The shrine to their patron Saint, Maria S.S. Odigitria. 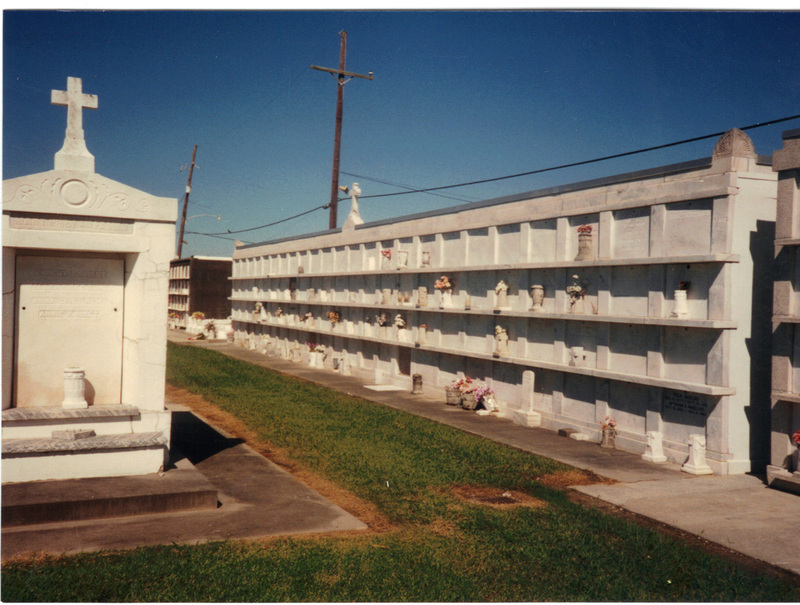 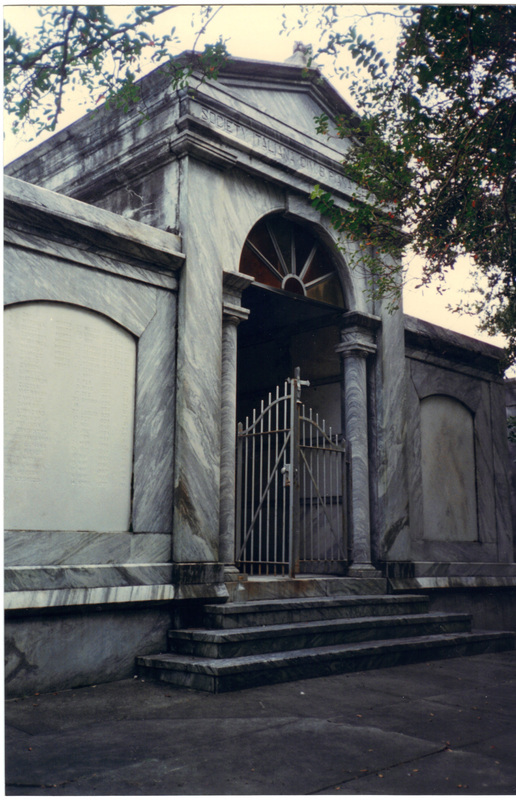 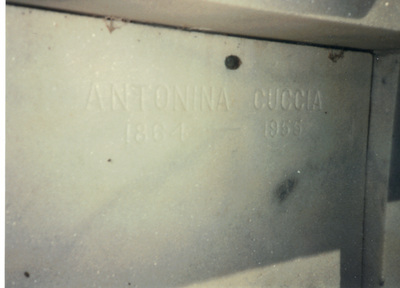 Andrea Cuccia's grave - the Piana dei Greci Society tomb / Metairie Cemetery. 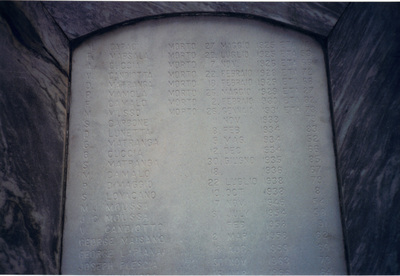 Carvings of the names of the decreased. Andrea's name is third from the top.